I always was a big fan of M.C.Escher and his recursive and impossible pictures. When I saw the first escheresque photograph I could not resist to search the web and find out how it is done. A few days ago I rediscovered the technique of the Droste effect. 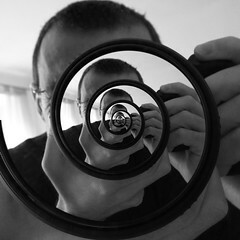 A Droste effect picture is a picture within a picture within a picture within a picture… a neverending spiral. This tutorial is based on the tutorial by Josh Sommers, which is a little outdated so I wrote a short guide on how to do it with current versions of the tools. As the original this version is directed at Windows users.